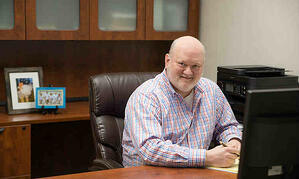 Born with a gift for teaching, Cliff Boggs is a natural part of the sales team at American Bedding. His passion for education is also what makes him another one of our company's Mattress Masterminds. Here's a closer look at Cliff's life and work — and the reasons why he does it all. What are your main responsibilities as a salesman at American Bedding? My main responsibility is to work directly with the customer. When they call, it is my responsibility to guide them through the purchasing process and then follow through with them until the product is safely delivered. That includes any customer service help I can provide, coordinating with our outstanding production team to ensure timeline requirements are met, working with our shipping & receiving team to make sure the product is packaged to the customer’s standard, communicating with the freight companies to coordinate a delivery schedule, and working with our receivables department to provide our customers with the documents they need. I have two degrees in education, so my background and training is in education. In 2005, I decided to make a career change. In August of that year, the opportunity to work at American Bedding became available. In October of 2005, I left for a few months to try something else, but came back to work at American Bedding in April of 2006. Twelve years later, I’m still here. When I came to work at American Bedding, I worked on the production team, physically making the mattresses for our customers. In January of 2008, I was asked to join the sales staff. I’ve been in that slot ever since then. One of the biggest challenges is freight issues. We are very careful to communicate to everyone our policy regarding freight concerns/issues, but when they happen it is always a delicate process. Without reservation, the most rewarding part of my job is providing for my family. I am thankful for the ability to work and take care of them. They provide the motivation I need to be at American Bedding and work hard every day. Working at American Bedding has truly been an eye-opening experience. Our customers are very special. We have the opportunity to work with 501c3 organizations all over the county. Being able to see how the homeless communities operate, and how we are able to help them in that process is truly fulfilling. When we work with youth camps with their bedding needs, knowing they are providing help and encouragement to the youth of our country is rewarding. Providing bedding for the men and women of our great military makes me unbelievably proud to be doing what I do. These are the people of our great county, and I have the privilege of talking to and working with these fine people every day. Spiritually speaking, my personal relationship with Jesus Christ is most important to me. I love Him with all my heart! Humanly speaking, as I mentioned above, my family is most important. My wife (Evangeline) and I have been married for 34 years and we have three wonderful children. Our first grandchild is on the way (January 2019). They are my life and my motivation. My wife and I love being at home, working around the house, but we also enjoy traveling. We also love spending time with our children. Our daughter and her husband live in our community, so we see them often. One of our sons and his wife is in the military (Army), so we enjoy visiting with them when we have the opportunity. Our youngest child lives in Burbank, CA, which makes seeing him a challenge, but we look forward to making the trip to see him when we are able. It's obvious that Cliff enjoys talking to clients. Give him a call with your mattress and bedding questions by clicking on the banner below!